So we spent yesterday at the lake with the fam. It was a great day. My brother played Captain and I played Goddess and the kids just played. I always feel amazing after a good dose of Vitamin D! Here’s a pic that sums up the day pretty well. No we’re not having any fun at all, are we? 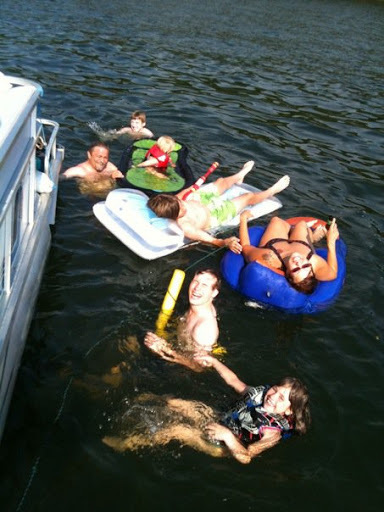 Of course, being on the lake just makes me long for some beach time. It wasn’t far from this time last year that I was frolicking in the sand and surf, soaking up all the Vitamin D I could. I’m so ready to do that again. Maybe I can squeeze some time in this summer…if the oil doesn’t manage to ruin it for everyone. This entry was posted in Family & Friends and tagged beach, fun, summer, sungoddess, vitamin D by Just Call Me Mel. Bookmark the permalink.